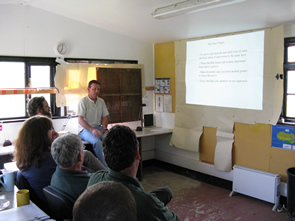 Each year we run several training courses on how to find and monitor nests while following the NRS code of conduct. Each course is led by an experienced nest finder and includes indoor and outdoor tutorials on different nest finding techniques, a workshop on the use of nest recording software (IPMR), and lots of time for supervised practice. If you are interested in monitoring nests for the Nest Record Scheme or a related survey, please do join us on a course. 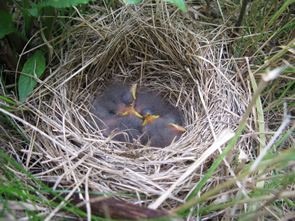 If you already have nest finding experience, please note that these courses focus mainly on open-nesting passerines. If you require specific guidance on monitoring nest boxes, colonies, wildfowl, raptors or waders, please contact the nrs [at] bto.org (subject: Nest%20recording%20guidance%20on%20other%20species) (Demography Team). Training courses for May 2019 will be listed shortly. This exciting course will teach you how to find birds’ nests and monitor them for the BTO’s Nest Record Scheme. Led by Carl Barimore and Mike Toms. Led by Tony Davis and Carl Barimore. The BTO Nest Record Scheme is funded by a partnership of the British Trust for Ornithology, the Joint Nature Conservation Committee (on behalf of: Natural England, Natural Resources Wales and Scottish Natural Heritage and the Department of Agriculture, Environment and Rural Affairs, Northern Ireland, and The National Parks and Wildlife Service (Ireland). © British Trust for Ornithology, BTO, The Nunnery, Thetford, Norfolk IP24 2PU, Tel: +44 (0)1842 750050 Fax: +44 (0)1842 750030 Email: nest.records [at] bto.org.